Philadelphia, PA -- A full 13 points out of the playoff race just over a month ago, the Flyers are doing a pretty good job of becoming this season's Lazarus. Regardless of the help the Boston Bruins may or may not provide in their late-season slide, and despite an inexplicably inauspicious start to this four-game home stand with losses to Columbus and Buffalo, it's looking like another skin-of-their-teeth finish. Michael Del Zotto netted the winner with 4:13 left in regulation and Philadelphia completed an unlikely weekend sweep thanks to a 3-2 decision over the Washington Capitals on Sunday afternoon. The goal, his fifth in 14 games, was set up by some laser vision from Jakub Voracek, who threaded the needle from the right-wing boards all the way across to his streaking defenseman for a perfectly placed shot high and inside the far post. Rob Zepp put another accomplishment in his pocket, winning back-to-back starts at the NHL level for the first time thanks to a 21-save effort. Claude Giroux netted his first goal in 11 games and Wayne Simmonds continued to dominate down low with his 24th goal of the season. "Like we said when we were 13 points away, we need to go game by game and just worry about our own game. When the overall game gets better, we start winning," Giroux said. "That's what we're doing right now, but we still have some things to look at and (make) better. We're a young team and we have got to learn." Mark Streit -- the prohibitive favorite for the Barry Ashbee Trophy as best defenseman -- chipped in two assists as the Orange and Black's point streak stretched to 12 of 13 games (8-1-4) and their gap towards the eighth and final playoff spot reduced to four points after the Bruins routed the Blackhawks in Chicago, 6-1. Tom Wilson and Joel Ward provided offense for the Capitals, who failed to pull out of a second-place tie with the Rangers and so remained tied for sixth in the East with 76 points. Braden Holtby stopped 25-of-28 pucks in defeat. Things got interesting with Holtby on the bench and Nick Schultz in the box for shooting the puck into the stands with 57 seconds remaining, but Braydon Coburn of all people came up with a big block on an Alex Ovechkin chance down the stretch and the Caps didn't have a quality chance for the remainder. Without delving too deeply into internal mechanics, the word on repeat lately has been belief -- that Ed Snider himself stated he had a hard time thinking this was a possible playoff team at the turn of the calendar, that Ron Hextall backed his men and Giroux and others scoffed at assertions the rest of the team lacked that quality. That said, how long until the post-game victory song turns from "Uptown Funk" to "I'm a Believer?" The Flyers were fortunate to snag the game's first power play and capitalized when Giroux's wrister from the lower left circle sailed through a Simmonds screen and past Holtby at 4:39 of the opening period. A sedate opening stanza finally got a little heated late in the first when Matt Niskanen clearly went knee-to-knee on Sean Couturier, only drawing a minor which carried over into the second period. Brooks Laich then took a swing at a puck and missed, drawing contact on Brayden Schenn's shield, so the hosts essentially had back-to-back two-minute power plays. They cashed in shortly into the second one, with Simmonds cleaning up a Streit point shot to make it 2-0 at 1:34. The Capitals received the game's next break, on a questionable roughing call to Coburn, and cashed in shortly after the advantage expired when everybody's favorite enemy forward capitalized off John Carlson's pass from a Luke Schenn turnover and beat Zepp at 5:23. After a lull in spirits on both sides, Washington knotted the score on a fluke drive by Ward, who spun around and whacked at a rolling puck from inside the left circle which beat a surprised Zepp under the crossbar with 4:38 left in the second. 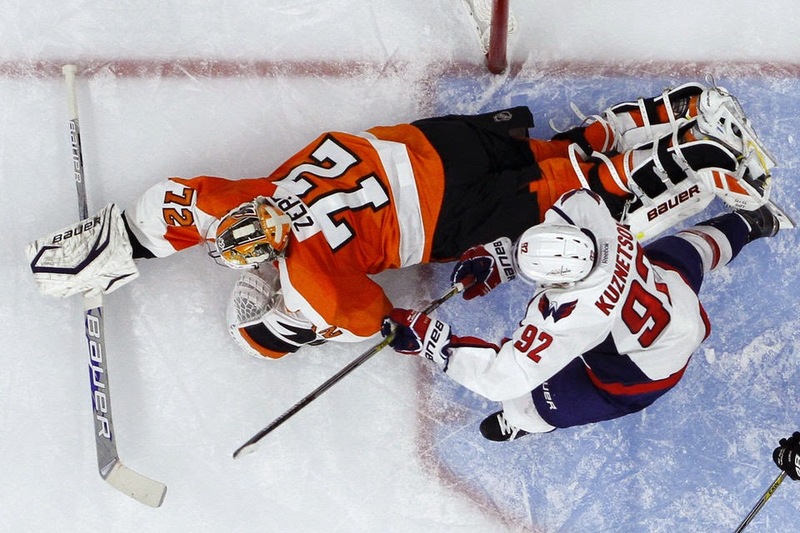 Holtby kept the game tied inside the final minute, stoning Ryan White on a clear breakaway and then padding away R.J. Umberger's rebound try from the slot. Philly had to kill off the remainder of a Streit minor and then a Del Zotto tripping call at the outset of the third. Zepp later denied a Marcus Johansson wraparound try just shy of the seven-minute mark. "As an athlete you play for game situations like this. We're fortunate to be here in a place where there's a lot of pressure and it's a lot of fun," said Zepp, who played consecutive games one week after starting a 3-in-3 for the Lehigh Valley Phantoms. Thanks to poor back checking and a horrible giveaway by Simmonds, Ward somehow broke free untouched up the middle as the clock ticked down to seven minutes to play in regulation, but his shot completely missed the net high and wide. “We just weren't sharp and they forced us not to be sharp. You have to be really prepared for that and we fell and dug ourselves a 2-0 hole," said Washington head coach Barry Trotz. Notes: The Flyers won three of four from the Capitals in the season series ... Philly heads to Carolina and Toronto on Tuesday and Thursday before returning home to face the Rangers, Calgary and St. Louis to complete a run of seven home games in nine dates ... Simmonds has collected 11 points (6G, 5A) in his last 10 games ... Voracek posted two assists and set a new career high in points during one season with 63, besting the 62 he had in 82 games last year ... In the second period, Capitals forward Jason Chimera delivered an obvious sucker punch to the face of Zac Rinaldo, with the latter somehow drawing a fighting major along with Chimera despite never taking off his gloves or offering to fight.